EBCO (BITAR) will expand its efforts to grow profitably in meeting customer needs today and in the future by continuing to build strong partnerships with our suppliers and foster employees’ engagement towards a sustainable future. Safety comes first; the safety of our employees, subcontractors, owners, and the general public is our primary concern. 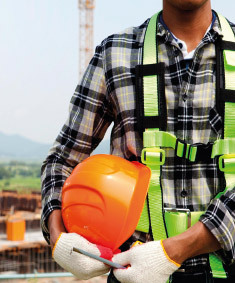 Safety coincides with quality and is an integral part of our business. We are conscientious in our actions and provide a safe workplace. We recognize our primary asset is people. 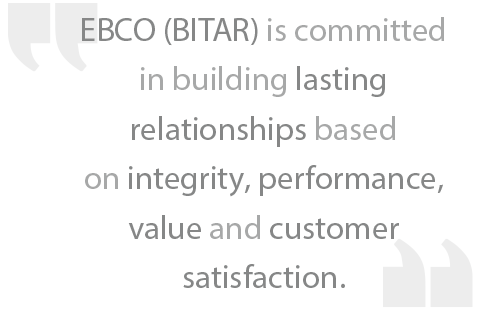 To be successful, EBCO (BITAR) must be a rewarding place to work. We provide opportunity and encouragement to help our people reach their potential. We work with our clients and our suppliers as a team. Mutual respect provides the foundation for our success. We remain true to our founding values of quality, honesty and hard work. We are committed to aligning our strategies with the United Nations Global Compact principles in the areas of human rights, labour environment and anti-corruption. We are keen to offer the highest standards of service, quality, and personal attention to clients. We constantly challenge ourselves to be the best.